When one writes endearing comments on posts or facebook or likes your hard work, it brings immense satisfaction. Appreciating hard work has many advantages. One makes new connections, learns new things, makes one a better person, makes one work harder and above all makes one happy. We can appreciate what life offers us, appreciate what others do for us, appreciate when one cares for you, appreciate when someone teaches us. Appreciating someone else’s work does not make one little but on the contrary makes them benevolent. Little words like sorry, thank you, hello, makes ones day more happy. Lets make a conscious effort to appreciate more and complain less. That sort of contradicts what I wrote in my last post, however, after venting my frustration and anger, I calm down and appreciate the better things in life. Coming to today’s recipe,what is a raita? It is simply a yogurt based side dish which may contain raw or cooked vegetables, fruits or boondi (chickpea drops fried) along with spices. It is usually served along with parathas, rotis, naans, rice, curries, vegetable dishes etc. It usually has cooling effect to a hot curry or biryani or even grilled meats and vegetables. I love having raita during the hot season and sometimes make a meal out of it. Do you appreciate someone’s hard work easily? Wash the eggplant, cut off the stem part and cut it into half. Place the eggplant halves on the sheet, cut side down. Brush oil over the eggplant. Roast the eggplant in the oven for 25 -30 minutes. Remove the eggplant from the oven. The flesh should have becomes soft. Let the eggplant cool a bit. Peel off the skin. Heat 1 tbsp oil in a pan over low to medium heat. Add fenugreek and then the mustard and cumin seeds. Add the chopped onion and stir fry till it becomes a bit soft. Add garlic and chopped chilli. Stir fry for a few seconds. Add the fried mixture to the mashed eggplant. Add yogurt, coriander and salt to the mixture. Mix well. Heat oil in a small pan over low heat. It should not be smoking hot. Add the dry chilli and the chilli powder. Immediately pour the mixture over the raita. Serve the raita immediately or put it in the fridge to chill it. Add chilli paste instead of chopped chilli. You can add ¼-½ tsp grated ginger. Add chopped grapes or pomegranate arils to the raita. This is my favorite raita, I like anything with eggplant, red colour of tadka looks very nice. Your post is really nice, I agree with you that we should appreciate everything we have in life. This raita looks fabulous! So thick and creamy! Yes, appreciation builds the other person's self esteem. And you are one of the best in appreciating someone else's work! Thank you for the kind words you write in my space! Thank you very much Sadhna. Thank you Beulah. Bloggers are the biggest support for each other. I love baigan and usually make curry with it. Got to try raita now! I love baingen raita and this is something that we prepare quite often during summers! I made it once too.. loved it .. a treat for baigan lovers. 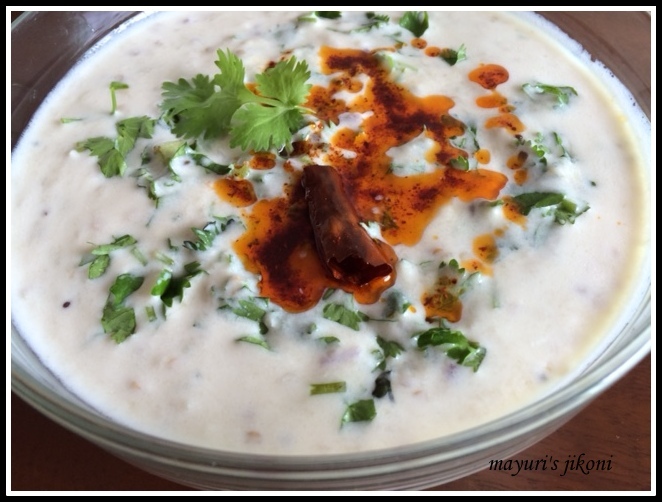 I love baingan raita but had never made one with the tempering. This looks delicious and you are right- it is perfect for the summer!